We all know that ramp time is a KPI for inside sales organziations. From our 2015 inside sales research, we also know that the percentage of companies with 5+ month ramp time has tripled since 2010. Online survey software company Qualtrics takes this seriously. And judging by their Glassdoor reviews, they are nailing it. Recently, I had a chance to speak with Charlie Besecker their Head of Sales Development, Sales Enablement and Professional Development. I asked him a few questions that I thought would be of interest to the inside sales community. 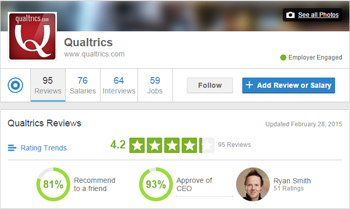 When did onboarding become a mission for Qualtrics? As cheesy as it is, we started with a mission statement: Construct and execute a meticulous, white-glove onboarding process providing individual, personalized success plans to cut new hire time-to-success in half. By "white-glove," imagine the nicest hotel in the world. They anticipate your every need before you even know you need it. When does your "white-glove" approach to onboarding begin? It starts with the offer letter. Each role within each department has pre-packaged content sent to them before their start date. In it we are sharing relevant information about the industry, our products, recent successes, and helpful facts about the organization. We pair the yet-to-start new hire with an informal mentor and share contact information and a brief introduction. Lastly, the day prior to their start, we send a message confirming the time, location, typical attire, and the names and pictures of the training coordinators that will be greeting them. We are really well prepared for when they walk in the door. Their work area is set up with great care. It is clean, organized, and complete with all the basic essentials. Cards are draped over the computers with their name, important phone numbers, a map of the building, Wi-Fi passwords, names and extensions of key people, and login information for internal systems. When starting day finally arrives, new hires see a sign outside the building “Hey Qubie, Your New Career Orientation Starts Right Here!” (Qubie is like Newbie for Qualtrics. Yeah, we’re nerds). The reception area is decorated like a party (we’re celebrating their arrival), with balloons, couches, breakfast, music, a few Qualtrics golf carts (see above: we’re nerds) and so on. Team leads, formal and informal mentors are invited to join if they can and finally the group is moved to the training facility for the company introduction. Each day for the first two weeks the training coordinator checks in with each new hire and makes sure they have everything they need and answers any questions they may have. In the end, we found the degree of care and personalization around onboarding has dramatically impacted the rate at which many employees get up to speed and appears to have reduced attrition—and this has nothing to do with the actual training process and content (perhaps a topic for another day). Have you gone "white-glove" in your onboarding? In what ways are you delivering amazing onboarding to your new hires?